This is a redo of the processing on an old image. Click on the image to see an older attempt, click again to return to the more recent processing. The new processing includes masked stretching that brings out more detail in NGC7331 and the tidal tails on Stephan's Quintet. The image is at full resolution so use your browser's zoom function to take a look around at the faint galaxies in the field and the detail in NGC7331. Given the amount of astigmatism in my Schmidt Newtonian, the stars were rather crappy so masked stretching and split star processing was used to keep them under control. In my earlier attempt I had to resize the the image substantially to keep the star sizes down. Processing Calibration, stacking. masked stretching done with Images Plus. Split star processing applied to keep the stars small as the galaxies were brightened. Multi-scale decomposition was used to increase the detail. 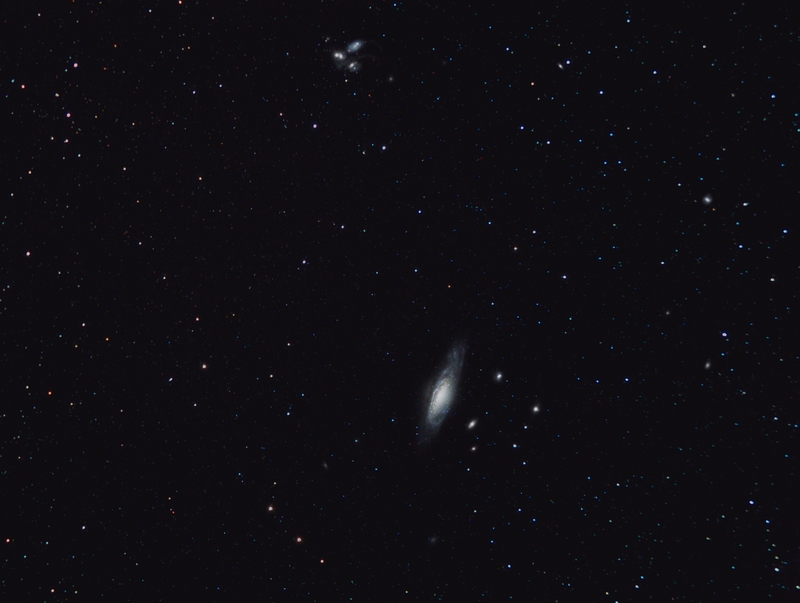 The stars and galaxy images were recombined and cropped.